Drosophila busckii, photographed by Kim van de Linde. 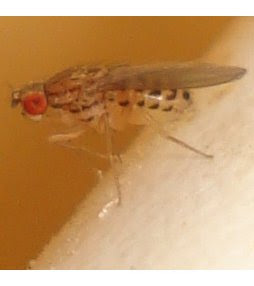 Contains: Drosophila (Drosophila), Drosophila (Sophophora). The Drosophilidae is a family of generally small flies, often feeding on fungi as larvae. The great majority of species are currently included in the (probably non-monophyletic) genus Drosophila. Characters (from Colless & McAlpine 1991): Antennal segment 2 cap-like. Proclinate fronto-orbital bristles generally present; postverticals more or less convergent. Costa broken beyond hm as well as Sc; Sc obsolete apically, free from R1. Mesopleural bristle absent. [C96] Campbell, N. A. 1996. Biology (4th ed.) The Benjamin/Cummings Publishing Company, Inc.: Menlo Park (California). Colless, D. H., & D. K. McAlpine. 1991. Diptera. In: CSIRO. The Insects of Australia, pp. 717-786. Melbourne University Press. [FS04] Fartyal, R. S., & B. K. Singh. 2004. A new species of the genus Paraleucophenga from the Kumaon region, India (Insecta, Diptera, Drosophilidae). Senckenbergiana Biologica 83 (2): 177-180. [G91] Groves, C. P. 1991. A Theory of Human and Primate Evolution, revised ed. Clarendon Press: Oxford. [JS71] Johnson, W. E. & R. K. Selander. 1971. Protein variation and systematics in kangaroo rats (genus Dipodomys). Systematic Zoology 20 (4): 377-405. [LG91] Li, W.-H., & D. Graur. 1991. Fundamentals of Molecular Evolution. Sinauer: Sunderland (MA). [L88] Liebherr, J. K. 1988. General patterns in West Indian insects, and graphical biogeographic analysis of some circum-Caribbean Platynus beetles (Carabidae). Systematic Zoology 37 (4): 385-409. [M47] Mayr, E. 1947. Ecological factors in speciation. Evolution 1: 263-288. [M90] McAlpine, J. F. 1990. Insecta: Diptera adults. In: Dindal, D. L. (ed.) Soil Biology Guide pp. 1211-1252. John Wiley & Sones: New York. [S85] Slatkin, M. 1985. Gene flow in natural populations. Annual Review of Ecology and Systematics 16: 393-430. [VD94] Vogler, A. P., & R. Desalle. 1994. Diagnosing units of conservation management. Conservation Biology 8 (2): 354-363. [WT11] Wiegmann, B. M., M. D. Trautwein, I. S. Winkler, N. B. Barr, J.-W. Kim, C. Lambkin, M. A. Bertone, B. K. Cassel, K. M. Bayless, A. M. Heimberg, B. M. Wheeler, K. J. Peterson, T. Pape, B. J. Sinclair, J. H. Skevington, V. Blagoderov, J. Caravas, S. N. Kutty, U. Schmidt-Ott, G. E. Kampmeier, F. C. Thompson, D. A. Grimaldi, A. T. Beckenbach, G. W. Courtney, M. Friedrich, R. Meier & D. K. Yeates. 2011. Episodic radiations in the fly tree of life. Proceedings of the National Academy of Sciences of the USA 108 (14): 5690-5695.